When I was a child I didn’t really care for fish and chips. Okay if we’re being honest, I hated the dish. Well just the fish, the chips I loved. What kid doesn’t like fries dipped in copious amounts of ketchup? Whenever we’d go on family trips to the beach, on the way back, we’d stop by the local seafood restaurant on Pacific Coast Highway. My mom and older sister would order fish and chips or shrimp and chips or fish tacos. My middle sister and I would end up getting a burger—because um hello burgers are delicious—but it was because we were those bratty kids that threw tantrums and yelled out at the top of our lungs, “Seafood is yucky! I DON’T want smelly fish! I HATE FISH AND CHIPS! !” Then we’d start crying and running around the restaurant throwing things off the tables and knocking people’s trays from their hands. Food would fly everywhere. Everyone would stare at my sister and I running amok and shake their heads and cover their mouths in shock. Okay I really wasn’t like that as a child. It was all my sister! I’d just stand back in horror and astonishment and pretend I wasn’t related to her. I’d join in with the crowd and ask “Who is that crazy animal? Who does she belong to?” Okay that really didn’t happen either. But the burgers, those totally happened, sans tantrums or crazy antics. 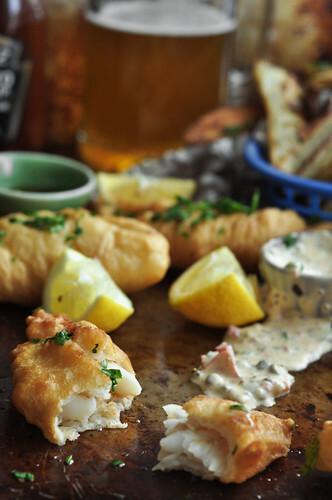 As I grew up and realized that seafood wasn’t the enemy, I began to love fish and chips, and not just for the chips. I fell in love with the battered and fried fish as well. Who would have thought? And so began a love affair with seafood. All seafood. Everyday seafood! (But not really because of the high levels of mercury). These days I can’t get enough of seafood and I deny ever getting a burger on those family excursions, while my family ate fish. “What burger? Nick ate the burger, I loved fish and chips. It was my favorite dish!” Thankfully nothing was filmed and they have no proof. Seafood and I were best friends when I was a child. That’s my story and I’m sticking to it. Now I know that spring is in full effect and we should be eating lighter, healthier, fresher meals. 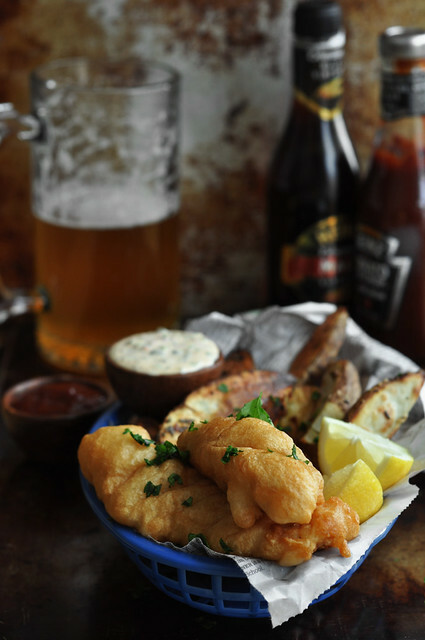 But really, who doesn’t have a soft spot for deep fried beer battered fish? Oh wait, and chips? This guy certainly has the biggest soft spot for it. And hey, at least I didn’t deep fry my chips. They’re oven roasted my friends, so completely healthy right? I’m doing my part for spring. Now go make some fish and chips and invite me over, I promise I won’t throw a tantrum. This is really two recipes combined into one delicious post. On one side we have our perfectly fried beer battered fish, and on the other end we have roasted garlic and rosemary potatoes. I suppose I could have separated the two recipes into two different posts (might be easier for you guys to look through) instead of one long post. Your scrolling fingers would’ve have more than appreciated that for sure. But what kind of person would I be if I didn’t put the two together? I mean, it’s Fish and Chips for crying out loud! You can’t have one without the other. So really I’m just doing all of us a service. Making sure we have taters with our fried fish. You’re welcome. 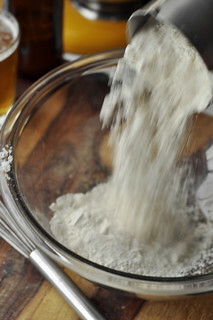 Let’s start with our beer batter. Not because it’s the most important part of this dish that it needs to go first, but rather we’re starting with it first because it’s best when it sits and rests for a bit. Like a few hours, a bit. Now I know what you’re thinking….”Who has the time to let the batter rest for a few hours?! 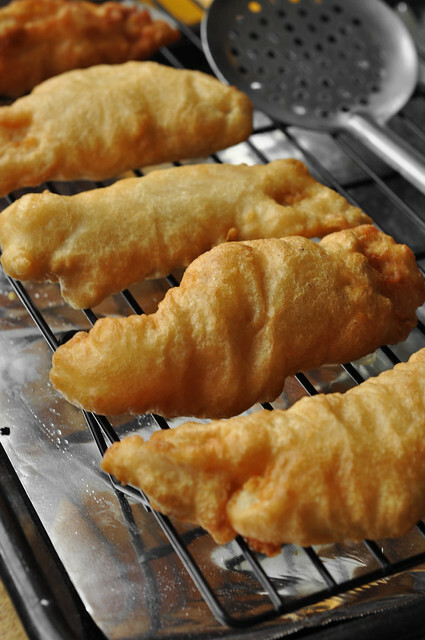 I want fish and chips, and I want them NOW!” Well you’re right, when you’re hungry, who can wait hours for the batter to sit? I’ll let you in on a little secret, you don’t have to wait that long if you don’t want to. Just let it sit for as long as you can. Any little bit helps. The beer creates this scientific reaction that I couldn’t even begin to describe because I don’t have a head for science. 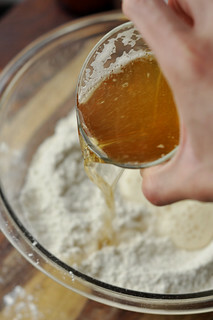 That’s why we’re making the batter first and then putting it off to the side and working on other parts of the recipe. 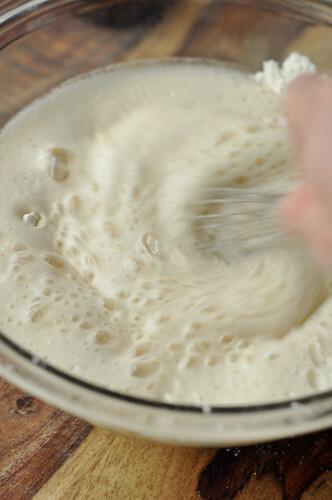 By the time you use the batter, it will have rested and it’ll be good-to-go. 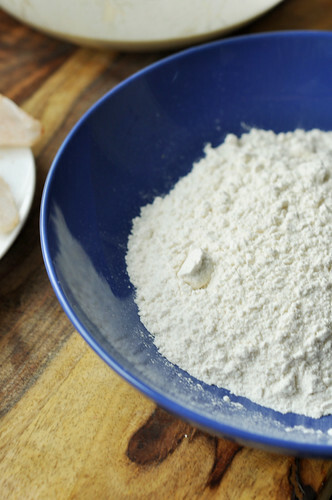 So in a large bowl, dump the flour and a teaspoon of baking powder. I like adding the baking powder because it makes the coating puff up while frying the fish. 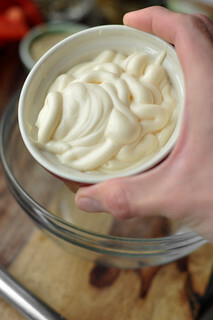 Give the two ingredients a whisk. You can now add the beer, go ahead I give you permission. You can use whatever light-colored beer you prefer. 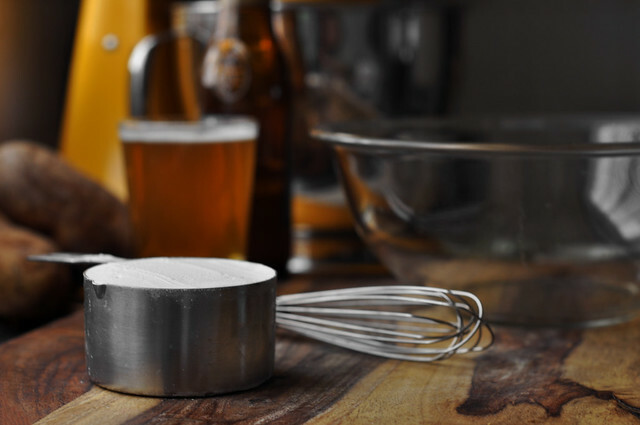 There isn’t a specific beer that you need to use, most work just fine for this recipe. Make sure it’s a light colored blonde beer, though. 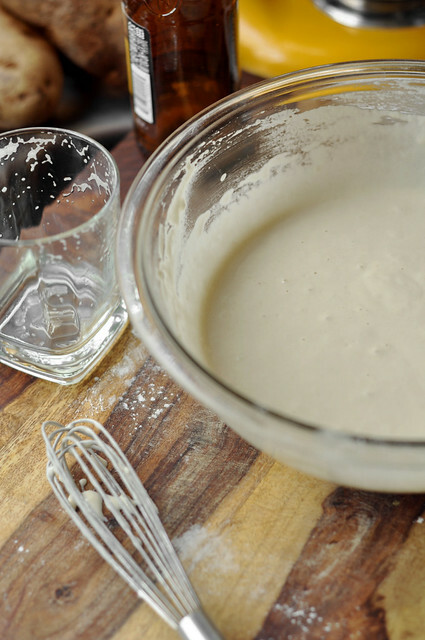 A darker brew might alter the color of the batter. 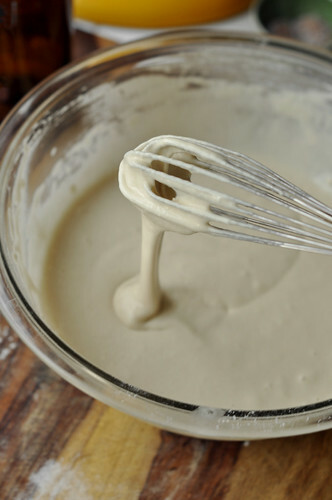 Whisk everything together until you have a smooth and thin batter. You definitely want this to be thinner than a pancake batter, but thicker than a crepe batter. So now that the batter is done, cover it loosely with plastic wrap and set it off to the side. Don’t worry about it until later on. Put it out of your mind and forget about it. Remember that the longer it sits, the better. So if you want to make this in the afternoon way before you start dinner, well then, that would be great. But if you were running late and made it just around dinner time, no worries, that works too. Now let’s turn our attention to the “chips” of our fish and chips. The perfect accompaniment. As you know by now the chips aren’t really chips. Or chips in the sense that we’ve come to know.They’re just fries and they are always deep fried. I thought I’d bypass the deep frying of my fries and roast them instead. Sure it’s healthier, but I assure you that wasn’t my intention (not at all). I’m all for deep fried french fries. All day. Every day. Give them to me now. However I always feel like it’s a huge hassle making perfect french fries at home what with the double frying and what not. I’m already frying the fish and that’s enough for me. So anyhow, where was I? Oh that’s right, we’re roasting the potatoes instead. Preheat the oven to 425°F (yes that high). And wash and dry your potatoes. I don’t like to peel my potatoes out of laziness sure, but also because I like the taste and look of the skin. You want to use a baking potato like a russet. 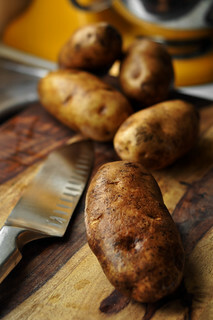 They hold up to the high temperatures unlike yellow or red skinned potatoes. 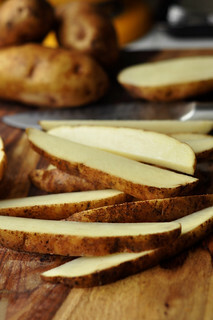 Cut the taters into long fry-shape wedges. 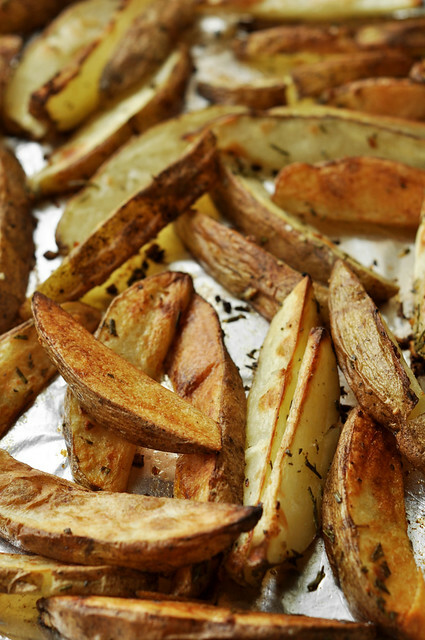 Drop the cut taters on a foil-lined baking sheet (makes clean-up a breeze — foil is a cook’s best friend). So at this point we can drizzle our “chips” with oil and season plainly with salt and pepper. Then throw them in the oven and have them roast, and while yes, they’d still be tasty, they wouldn’t be all that flavorful (bland really). 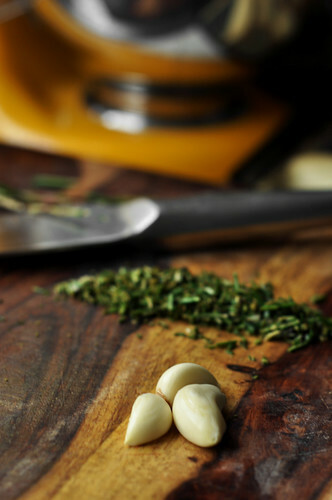 So we’re taking it a step further giving them a BOOM-KA-POW with some fresh rosemary and garlic. Chop some up, what are you waiting for? 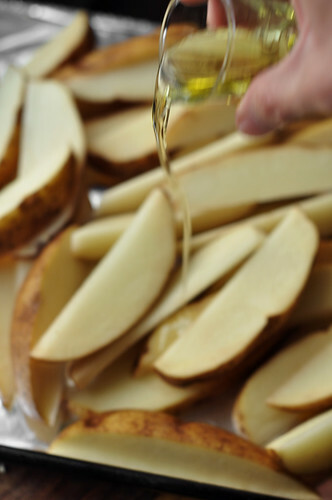 Drizzle the potatoes with olive oil. Make sure you don’t skimp on the oil, you don’t want the potatoes to stick to the foil (think of that horrible PAM commercial). 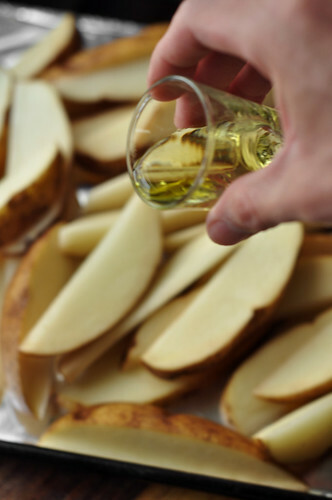 After all, we did healthify this by not deep frying our chips, so it’s okay to use a bit more olive oil than usual. Plus word on the street is that olive oil is good for our hearts right? 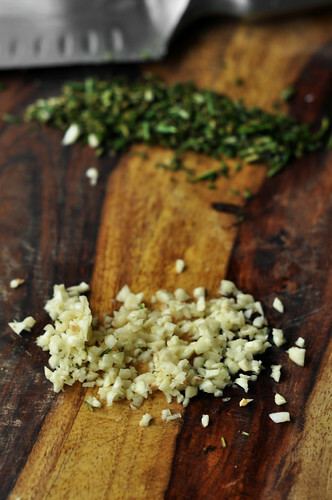 Sprinkle with the chopped rosemary and garlic. 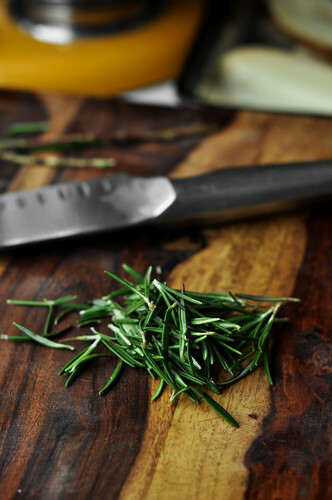 Which incidentally now would be a great time to say that if you don’t care for rosemary (now now don’t laugh there are people out there that don’t — like my mom for instance, crazy woman) you can use thyme instead. 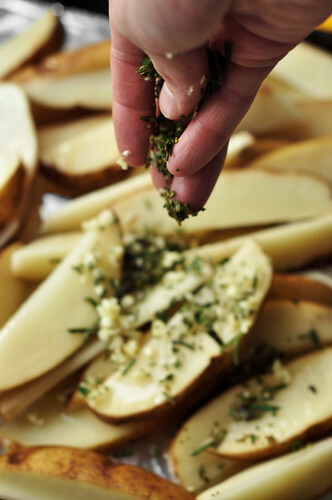 Thyme is fantastic with potatoes as well. 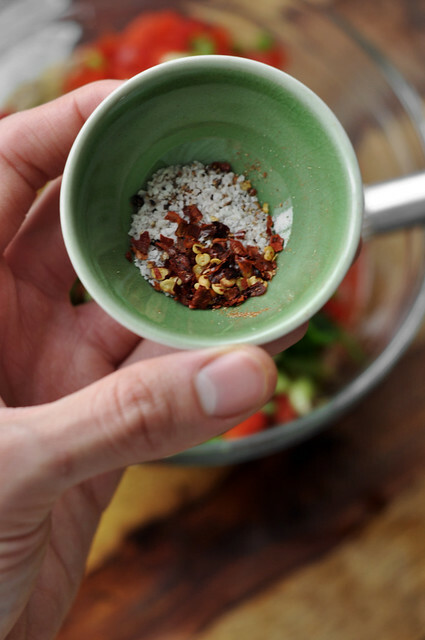 Do you remember back in an old post, a little diddy entitled Irish Nachos, we made our own house seasoning? Well if you have a great memory you’ll recall that we did make a house seasoning. But for those of us (mostly myself) who don’t remember anything past yesterday, it was a simple blend of salt, freshly cracked black pepper, garlic powder and cayenne pepper. You can click on the link above to see the exact amounts. I just eyeball everything, shhhhh. 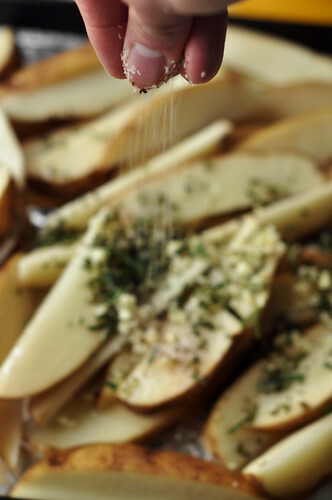 Anyhow, we’re going to season the taters with our fancy house seasoning. (You can just season with salt and pepper if you’d like, but why? why? WHY?!?!). Okay so that’s all I wrote, give the potatoes a good mix and stir with your paws and make sure everything is well coated. 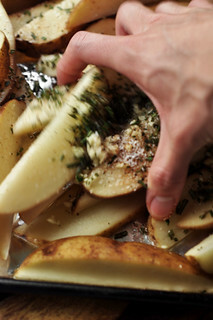 After you’ve mixed it all up, spread out the potatoes evenly on the pan in one single layer. 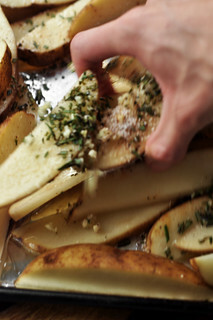 You might need two baking sheets if your potatoes are too many and the space too little. 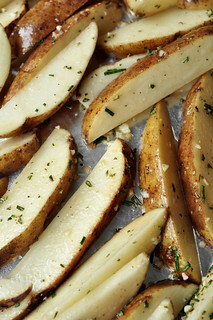 Pop them in the preheated oven and roast for 25 to 30 minutes. 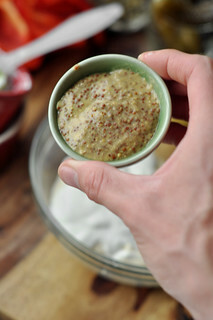 And now let’s make our spicy remoulade dipping sauce. Mostly because we’re still killing time allowing for the batter to sit and the taters to cook, but mainly because I’m impatient and this is a really really good sauce. It’s finger lickin’ good….do I owe the Colonel some money for that one? So a remoulade is most commonly a cajun sauce with a kick. I’ve often had it with fried catfish as a dipping sauce (yum!). Now you might be asking “What in the world are you doing Jonathan? Cajun dipping sauce with British fish and chips? Where’s the tarter sauce?” Well at the risk of angering many, I do not care for tarter sauce. There I said it. My name is Jonathan Melendez and I loathe with a passion greater than the universe dislike tarter sauce. I don’t know why that is exactly…..perhaps the tangy flavor that isn’t balanced with any other flavor. Who knows, point is I don’t like it so we’re not making it. You’ll love this remoulade instead, I promise. 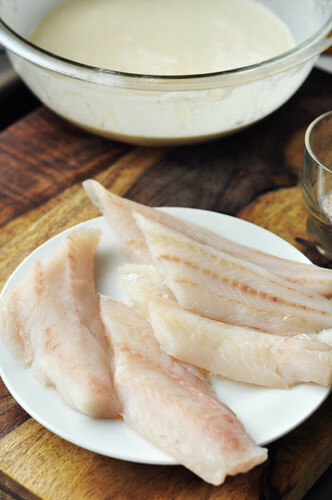 You’ll make it and use it as a sauce or dip for all your fishy needs (fishay fishay — where’s the dancing fish when you need it?) It’s AMAZING, help me say UHH-MAZING with grilled shrimp as well. I’m sure you’ll have some extra sauce for grilled shrimp dipping later on so you’re very welcome for that one. I’m always thinking of you. It might look a little daunting because it appears like there’s a lot going on for one sauce. You’re right, there is a lot going on, I’m not going to lie to you. Mainly because you won’t believe me since you can see for yourself that there are a plethora of ingredients. But it’s worth it, you’ll see. 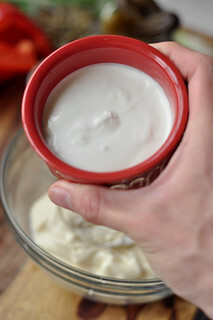 We start with some mayo and we’re cutting that heavy thick fatty mayo with some sour cream (don’t be bringing any of that low-fat, fat-free stuff to this party. They’re not invited) and some grainy mustard, or dijon if that’s all you have on hand. I’ll compromise. And now for some chopping and cutting and mincing. 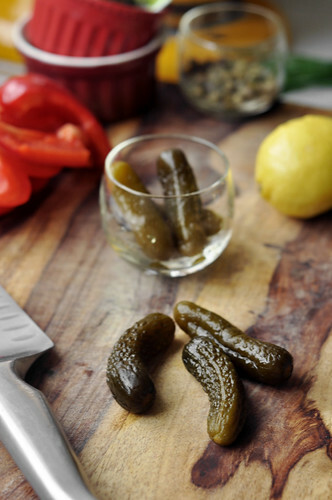 We’re going to need some pickles, I’m using sweet gherkins (you can use cornichons or dill pickles as well). 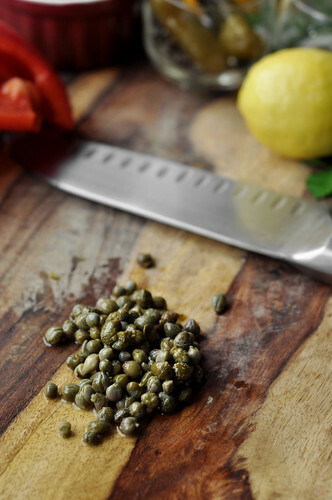 Next up, capers. Drain them and give ’em a rough chop chop. Hee-ya! 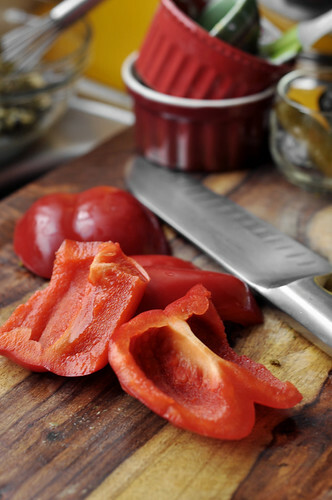 We’re also going to need red bell pepper. About half of one. 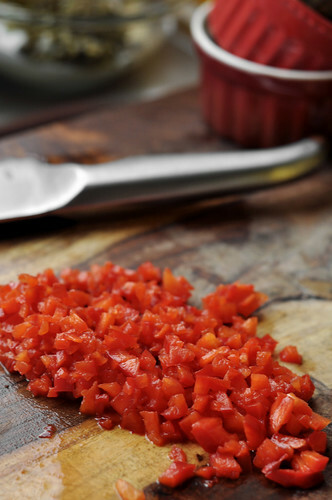 We’re just eyeballing everything for this sauce. There’s no real science to this, just make sure the veggies are all chopped finely and relatively the same size. 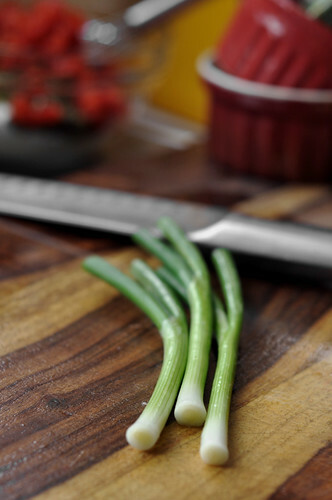 A few scallions, throw those into the mix as well. Sliced. We’re also going to add some parsley because, why not, we’ve added everything else. We’re just missing the kitchen sink is all, but don’t worry that’s next. Let’s do some fresh lemon juice yes? Well I’m adding it either way so you had better have said yes. 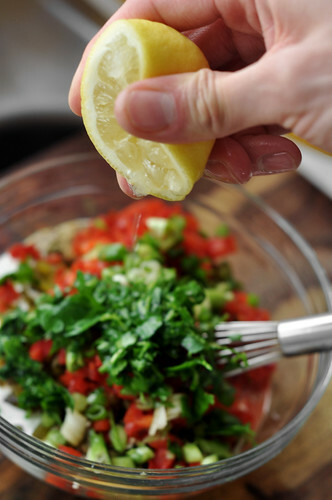 I’m often asked (mostly by my sister, okay always by my sister) if you can use lime juice in place of lemon juice. Um no. They’re both distinct flavors and go well with certain ingredients. Limes I think of more for Latin/Tex-Mex/South West dishes while lemons I correlate with Italian/Cajun/Southern dishes. That’s what’s up. Feel free to throw in a jalapeño if you’d like to make it super spicy. I’m just going to add crushed red pepper flake. That’s enough heat for me. And some salt and pepper to taste. 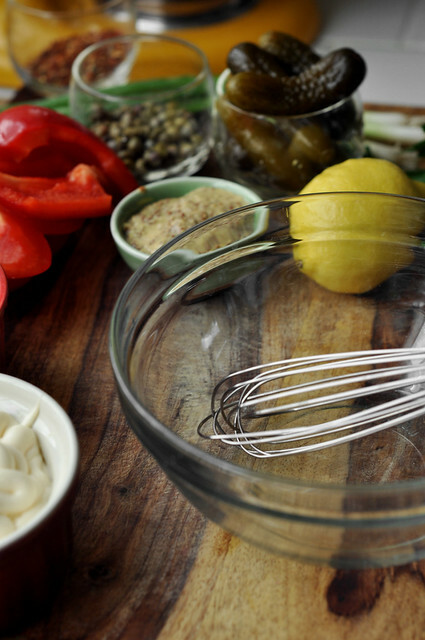 Give it a whisk to combine and check the seasonings, adjust accordingly. Cover with plastic wrap and pop it in the fridge. Allow it to chill and rest. The longer it sits the better the flavor will be. It’ll give it a chance for all the ingredients to blend together. We are now ready to start on our fish portion of the fish and chips. I’m going to be using cod for this recipe. I just think that it’s a perfect fish for frying and it doesn’t break the bank either, which is nice. And as we all know feeding a family can be tough, emptying the wallet doesn’t need to happen in order for us to do it. Try to use fresh fish (if you can find it or have access to it) but if you must and only if you absolutely must, well then go ahead and use frozen. Either way, cut the fish into big pieces. I just cut it in half on an angle and then seasoned it with our house seasoning (salt, pepper, garlic powder, and cayenne). The fish is seasoned and set to go, the batter is awaiting us and now we need to get a shallow dish with flour ready. 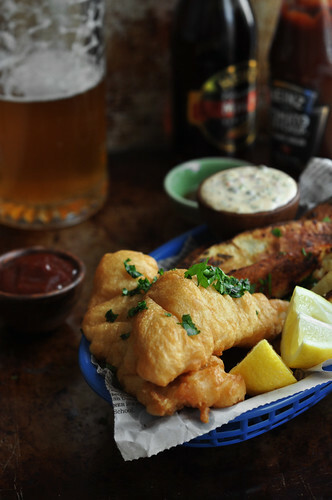 We’re going to dredge the fish with flour before dipping it into the beer batter. 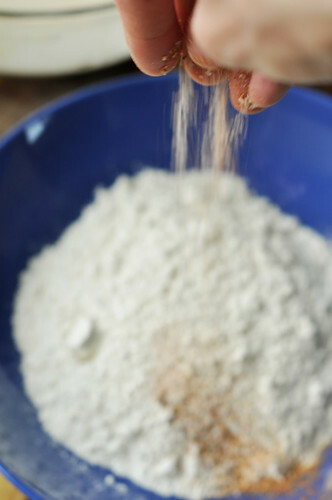 Season the flour with some of the house seasoning as well. 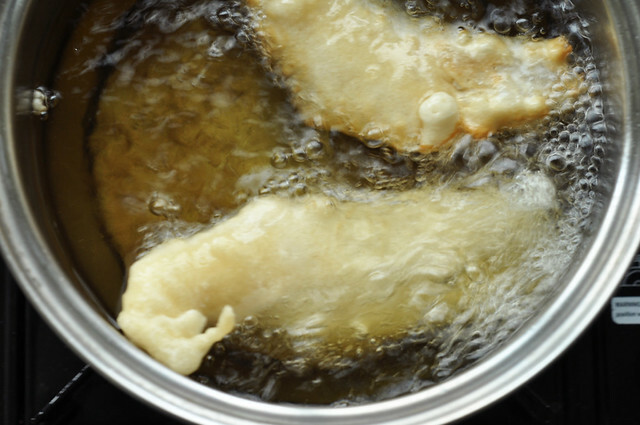 Let’s get started…oh wait, before we get our hands dirty, heat the oil for frying. I don’t have a deep fryer (no available counter space or patience for dealing with a deep fryer) so I’m just using a pot filled with canola oil. Filled about halfway up. It’s not that large of a pot, as you can see, nothing fancy here. Okay while that’s heating up (it should be around 350°-375°) you can dredge the fish. 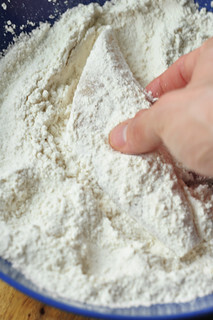 Grab a cod fillet and drop it into the flour, turn it over and coat the other side. 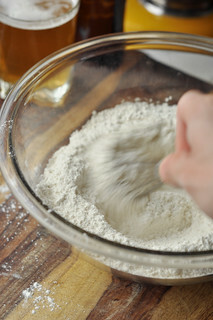 Then pick it up and dust off the excess flour. 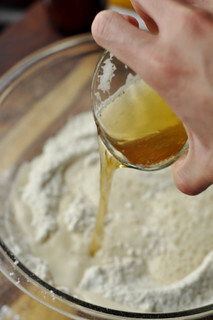 Then drop it into the beer batter. 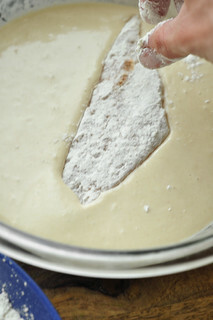 Flip it over and drain off the excess batter. 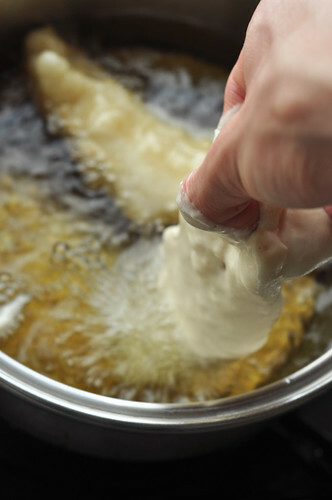 Carefully drop, no I should say place, yes oh-so-carefully place the battered fish into the oil. I like to add it to the oil slowly and allow one end of the fish to sit in the oil for a bit before adding it all so that the fish can float and not sink to the bottom. Does that make sense? I might’ve just confused us all. Repeat with the remaining fish. Do not overcrowd the pot though or else the oil will drop in temperature and your fish won’t fry nicely (it’ll be soggy and greasy and gross). Since I used a small pot I fried two pieces at a time. I got nothing but time. It’s okay if your fingers are all gunky from the batter, it creates a protective barrier just incase the tips touch the hot oil by accident. I can’t even begin to tell you how many times that’s happened to me. Like a thousand….okay okay, more like 2. So the fish will fry up rather fast for ya. The first side will take about 4 to 6 minutes. And then about 2 to 3 minutes on the second side. Only flip the fish once, don’t continuously turn it as it wont fry evenly. As you can see the baking powder really allows the batter to puff up and get crispy. You’ll know the fish is ready because it’ll look golden brown and perfect like that up there or like that one down there. 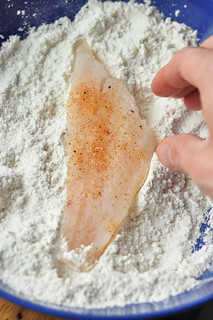 Take the fish out with a slotted spoon and drain it on a plate lined with paper towels, brown paper bags or newspaper. 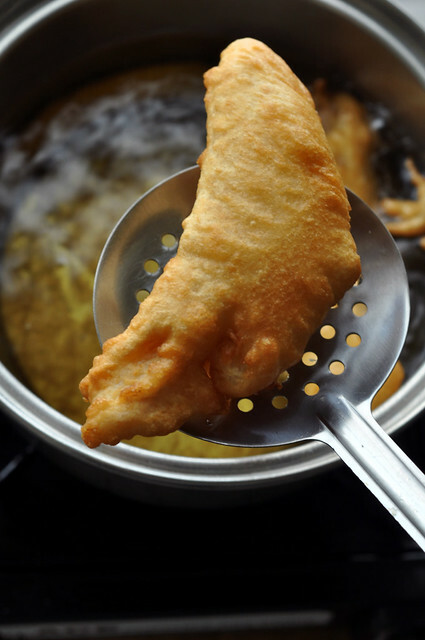 Since we’re frying the fish in batches, we want to keep the fried finished pieces warm and crispy so it’s best to place them on a cooling rack over a baking sheet. You can place the baking sheet in a 200°F oven to keep the fish warm and crispy while you fry the rest. You can keep those warm in the 200°F oven along with the fish until ready to serve. 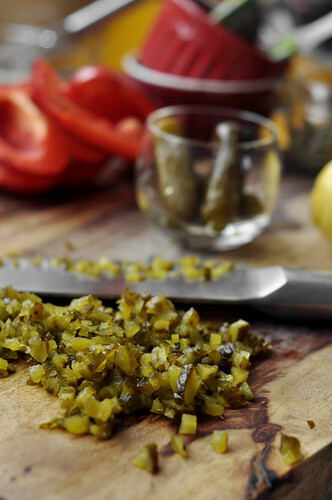 Serve it alongside our spicy remoulade for dipping and ketchup and of course some malt vinegar. This is British pub food after all. And of course we mustn’t forget about a cold brew to wash it all down. 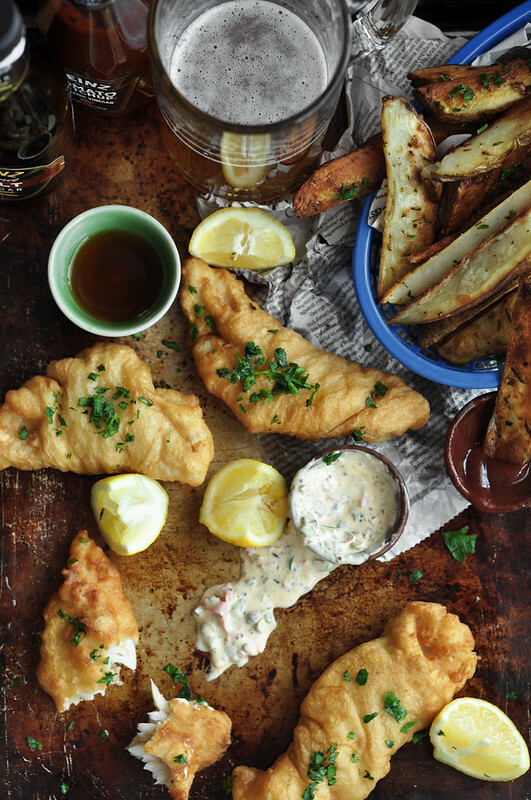 I like to serve the fish and chips in those fry baskets just because it’s fun and we all need a little fun every once in a while. Sprinkle the fish and chips with fresh parsley for color not really for taste (let’s be honest parsley doesn’t taste like anything. It’s a plant. We’re eating leaves. I’m kidding it totally has a taste…but not really). 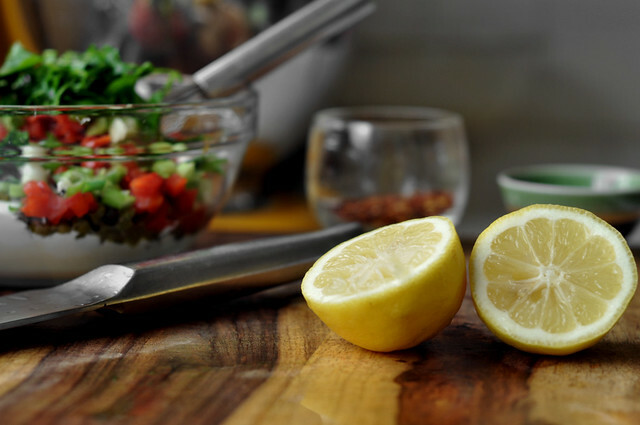 And also add a few lemon wedges, fish is always delicious with lemon. They go hand in hand. Seafood and lemon, old friends. I might go on record to say that this is the best thing I’ve EVER made. Don’t hold me to this though, I might retract that statement later on. It’s utterly delicious. If I could, I’d eat this everyday, but my doctor would surely disapprove. But in a perfect world, I’d eat this everyday and finish it off with a doughnut (okay a few doughnuts) for dessert. If I was on the Food Network and participated on that show “Best Thing I Ever Made……Fried Food Edition” this would be the dish I choose. Then I’d demand it be made for me so I could eat it while on camera and have thousands of viewers see me eat fish and chips. Too much? The recipes are delicious on their own so if you’d like to make the fish and serve it with something else on the side like a green salad (too healthy, don’t you dare) or potato salad (I approve) or rice (delicious with everything) instead, that would work too. 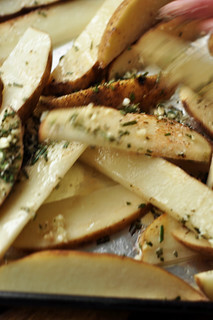 Or you can use the rosemary garlic roasted potatoes recipe as a side for another dish. Like sandwiches or a juicy seared steak. Or you can just make them together because together it’s just the best meal ever. You know what’s the best part of this meal? It’s not the yummy friedness of it all, nope. It’s not even the cold brewski to wash it all down with, uh uh. It’s the fact that you don’t need utensils. I can be a cave man for a day and eat with my hands like the animal I know I am within, deep down inside. Eating with your hands is just plain fun. Exciting and inviting is what it is. 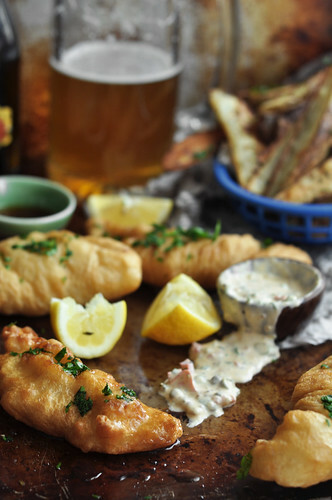 Having lemon juice running down your hands and fingers and remoulade and ketchup all over your face, while you eat ridiculous amounts of beer battered fish and crispy chips…..yes please. I couldn’t think of anything more entertaining than that, my friends. 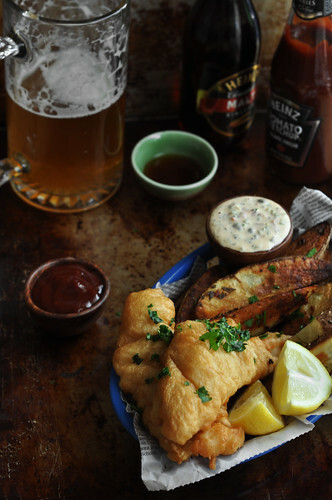 I just want to point out that Mother’s Day is coming up very soon, and I speak for ALL mom’s out there (especially mine) that nothing would be better or show more appreciation for the women who raised you, then if you made your mamma’s this Beer Battered Fish and Chips. Just saying. And although I don’t have the authority to say this because I’m not a mother, I do know for a fact that people love fish and chips. Moms especially. So what are you waiting for? Make your mamma a basket of this incredible fare for her special day. Don’t forget the beer. 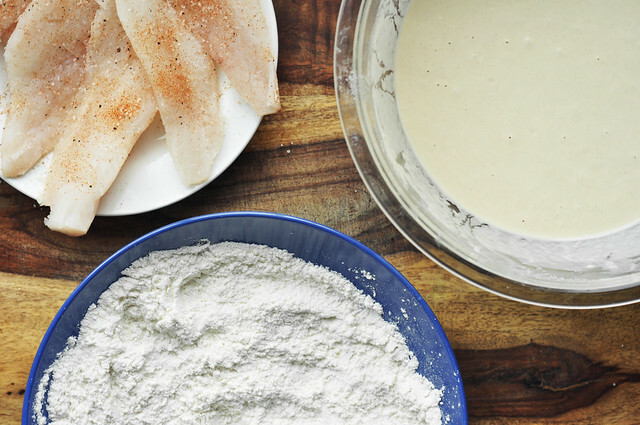 It’s best to make the batter a few hours before you actually dip the fish. 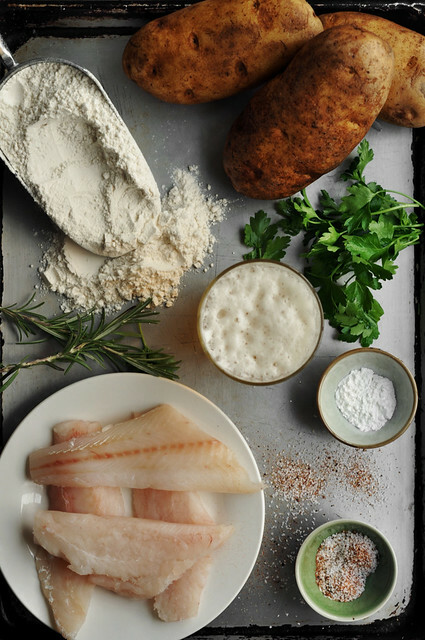 The resting time will allow the bubbles in the beer to activate the baking powder and flour, making for a crispier, fluffier crust when the fish fries. 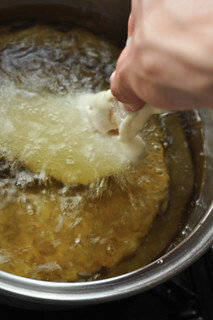 You can also use this beer batter for frying up onion rings or green beans! 1. 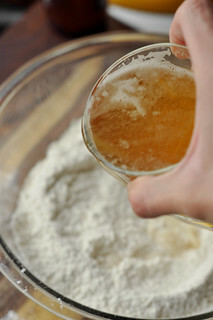 In a large bowl whisk together the flour, baking powder, and beer until a smooth thin batter forms. 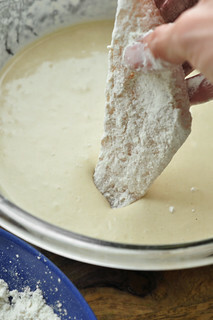 If the batter is too thick add a bit more beer (or water or club soda) to thin it out. 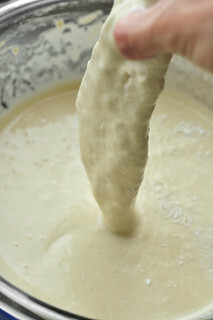 If the batter is too thin add a bit more flour to thicken it. It should be thinner than a pancake batter but slightly thicker than a crepe batter. Loosely cover with plastic wrap and let stand at room temperature for at least 30 minutes but 2 hours would be better. 2. 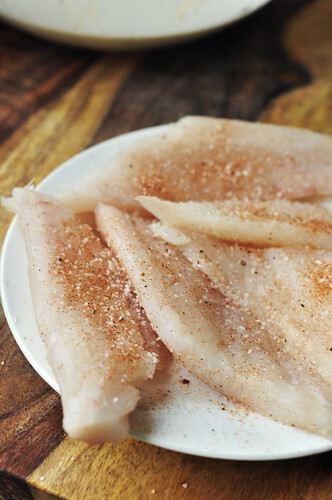 Cut the cod fillets into (5 to 6 inch) strips. My rule of thumb is that 1 (8-ounce) fillet can feed about 2 people. Pat the fish with a paper towel to make sure it is completely dry. Season both sides with some of the salt, black pepper, garlic powder and cayenne pepper. Reserve half of the seasonings for later on. 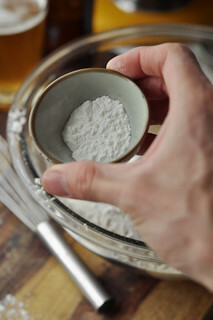 In a shallow dish, pour the 1 cup of all-purpose flour and the reserved salt, black pepper, garlic powder and cayenne pepper, whisk or stir to combine. That is your flour dredging. We do this so the beer batter can stick to the fish. 3. 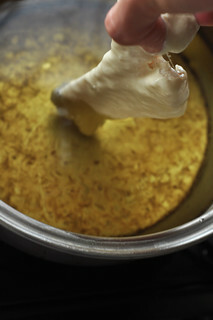 In a large pot, or dutch oven, heat oil to 375°. 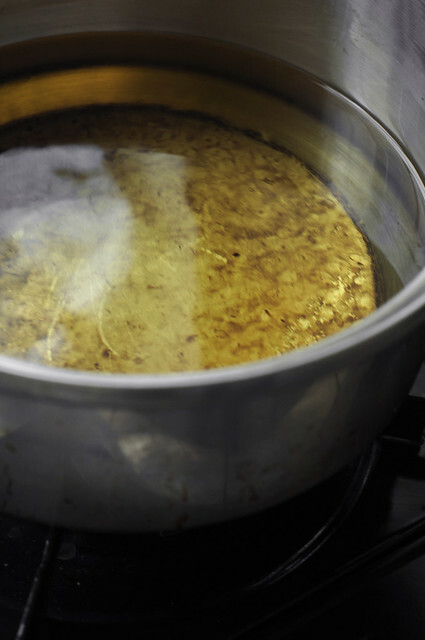 If you fill up the pot halfway with oil, that should be fine. 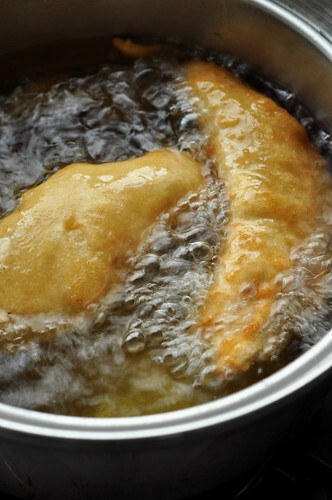 Once the oil is hot, the fish is ready to be fried. 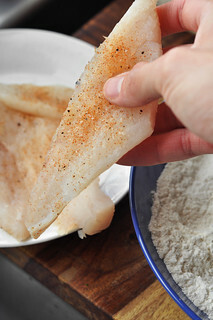 Working with one strip at a time, dip the fish into the seasoned flour, coat evenly on both sides. 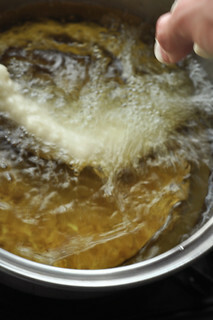 Then dip the fish into the beer batter, completely dunking it until it is fully submerged. 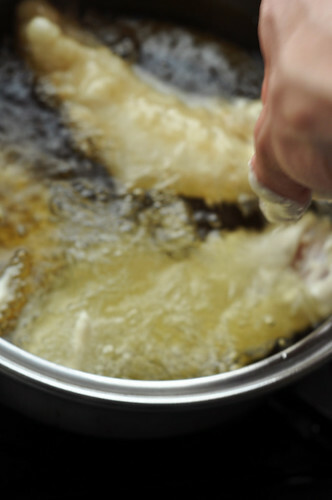 Drain excess batter and then carefully drop the battered fish into the oil. Don’t overcrowd the pot, work in batches. Fry for 4 to 6 minutes on the first side. Flip it over and continue to cook for another 2 to 3 minutes on the second side. Only flip the fish once. Remove from the oil and drain on paper towels. Transfer to a cooling rack placed on top of a baking sheet. Repeat with remaining fish. 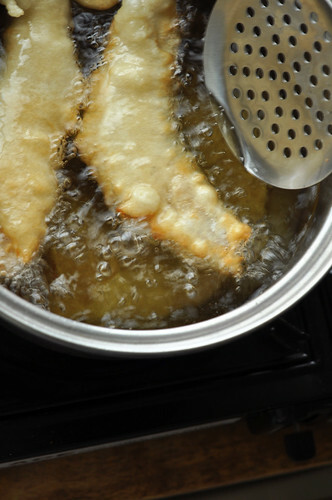 To keep the fried fish warm and crispy until ready to eat, place the baking sheet in a 200°F oven. 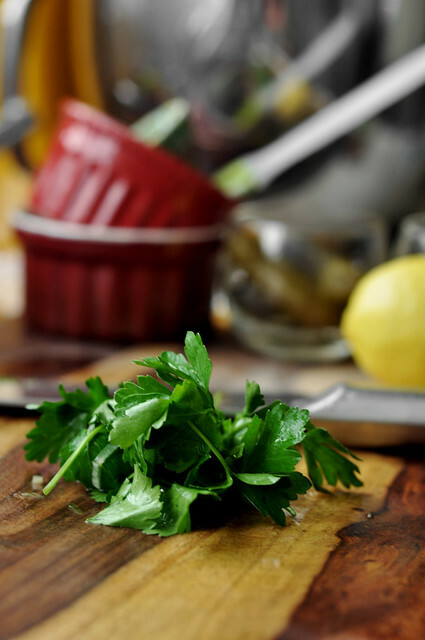 Serve warm with lemon wedges, malt vinegar and a sprinkling of chopped fresh parsley. Enjoy! 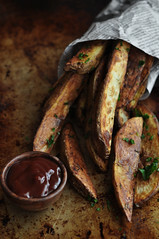 These roasted potatoes are the perfect accompaniment to any sandwich, burger, hot dog, or of course beer battered fish. They’re are also perfect by themselves as a tasty snack. Can’t find rosemary or don’t have any on hand? 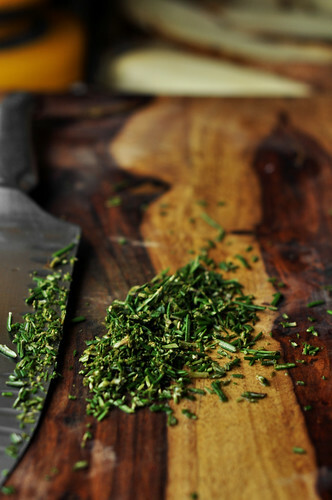 Try using fresh thyme instead! 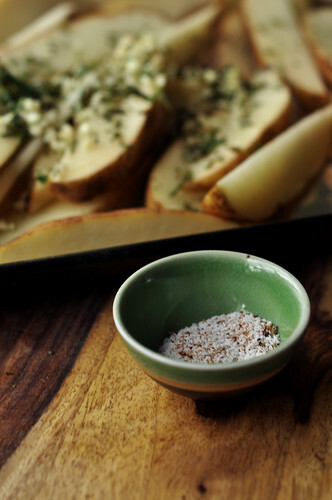 You can even sprinkle on some freshly grated parmesan at the last ten minutes of baking. 1. Preheat oven to 425°F. Line 2 baking sheets with foil paper. Set aside. 2. 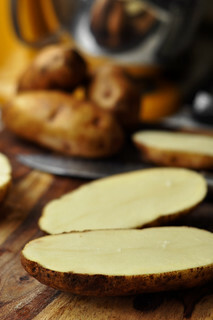 Cut the potatoes into long wedges, you’ll get about 8 pieces out of one potato. 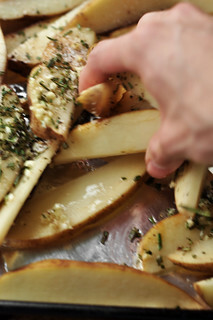 Place the wedges evenly among both prepared baking sheets. Make sure the potatoes are in one even layer, and not on top of each other. Sprinkle with olive oil, chopped rosemary, garlic, salt, black pepper, and cayenne pepper (dividing among both baking pans). Place in the oven and roast for 25 to 30 minutes or until golden brown. 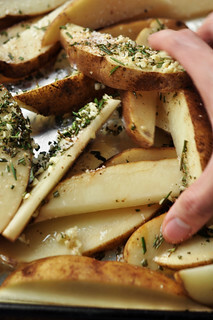 Open the oven only once during baking, halfway, to flip the potatoes over. 3. Once golden brown and crispy, remove from the oven and allow to slightly cool. 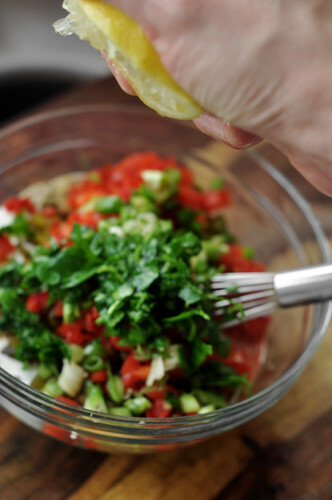 Sprinkle with chopped parsley and serve warm. Enjoy! This sauce is amazing with any kind of fish. Serve it along side grilled shrimp or fried catfish nuggets. If you’re not a fan of spicy you can omit the crushed red pepper flakes, but if you like it super spicy you can add a chopped jalapeño! 1. 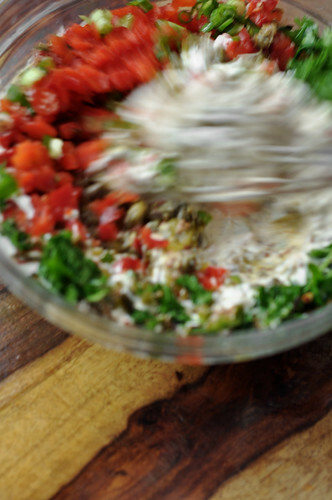 Combine all the ingredients in a medium bowl until completely combined. 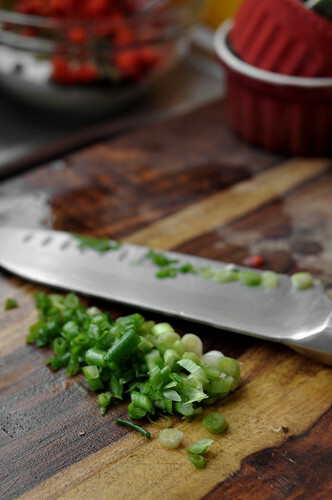 Taste and check for seasonings, adjust accordingly. Store in an airtight container in the fridge until ready to use. Will keep refrigerated for up to 5 days. Enjoy! YUM. That remoulade looks so good! 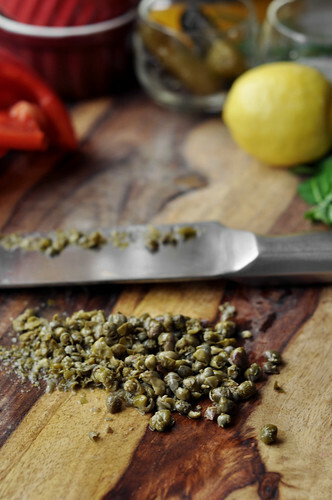 Love that there are capers in it. Seriously Jonathan, this is all out of control. I’m with you on that tarter sauce train. There’s only one restaurant that makes some that I like, besides that I usually throw something together involving pickles, olive, and pepperoncinis. I’m going to have to try that remoulade though! And like I mentioned before, I want those steak fries, potatoes for everyone! YUM! 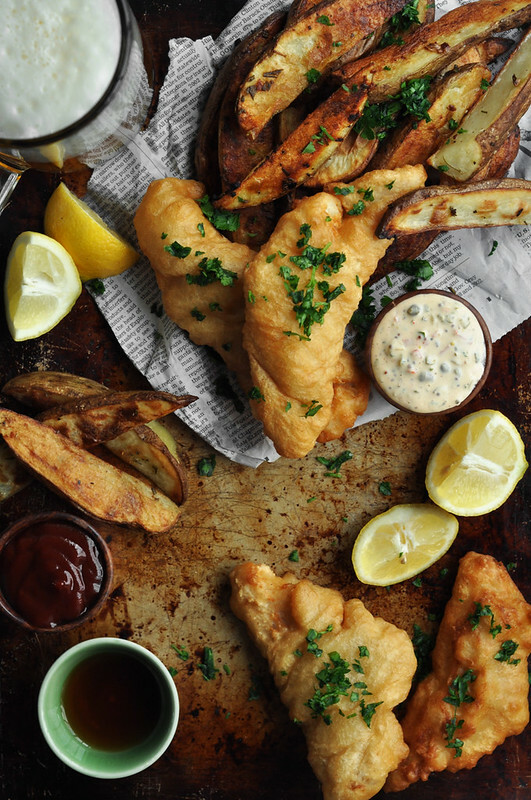 I actually always loved Fish & Chips–my dad is English, so I used to have it in England all the time during visits to see family and it was always my favorite pub food. This look amazingly delicious! Love all the photos of the entire process. I love the story!!! I couldn’t stop laughing, now when I eat fish and chips I will be thinking of your fish tantrum!! Looks delicious! 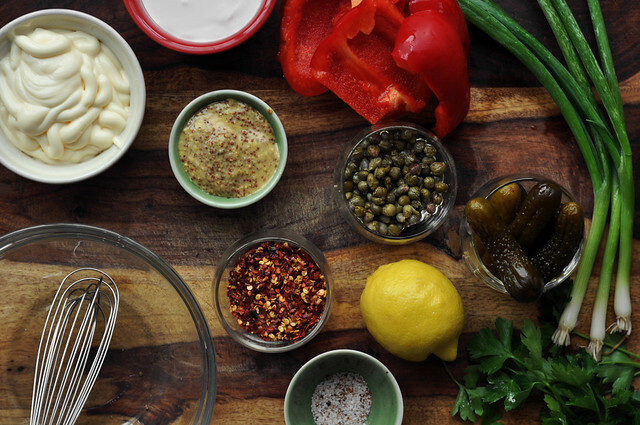 But maybe tartar sauce is different in Australia than the US – the way I make it is almost identical to the ingredients in your remoulade; just minus the red pepper. Most people don’t put mustard in it either but I always have. We do spell it “tartare” sauce over here so maybe it is different. I love you. I love this post. I love the recipe. I love fish and chips. Thanks for sharing! Brilliant post, you had me in stiches 😀 Ok so you’ve convinced me to make these sooner rather than later. All of that looks so amazing! I can’t even pick a favorite part. 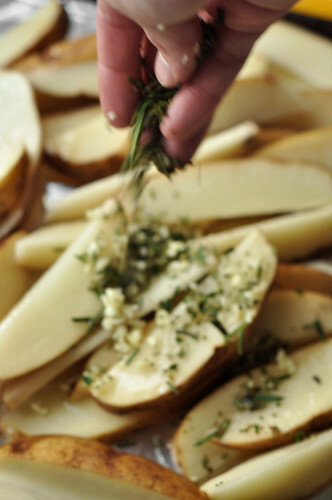 Although I must admit the whole garlic and rosemary business on the potatoes sounds particularly delicious. Bookmarking! 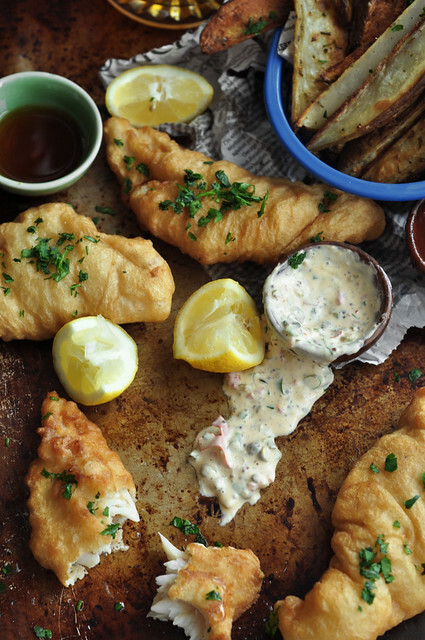 I tried the fish last night but opted out of the fries and sauce (it was late and I didn’t want fries, and I didn’t plan on using sauce anyway – just lemon) and I just wanted to say that the batter recipe was outstanding. It was easily the best fish that myself or my husband have ever made, and it was SO EASY. I cannot wait to make it again and again. I think I’ve found a new favorite quick dinner after I’ve worked double shifts or generally don’t feel like cooking much. Thank you for making it! I’m happy to hear that you enjoyed it!! Hope you give some of the other recipes a try soon. Wink wink. Change “attention” to “intention” and this post is golden (sorry, it really bothered me). I’ve been thinking about cooking fish, now I have a recipe. Horray!! Thank you so much for looking out!! It would’ve bothered me as well! Sometimes it’s hard to catch everything! Hope you give it a try soon! DELISH!!! We made this tonight…all I had in the house for flour was whole wheat, so I used sprouted whole wheat and it was wonderful! We cooked it in coconut oil (canola oil is generally a GMO food, and even if it isn’t, it’s HIGHLY processed so we avoid it like the plague). We only cooked it for about 3 minutes per piece (4 min for the thick ones) and it was done! 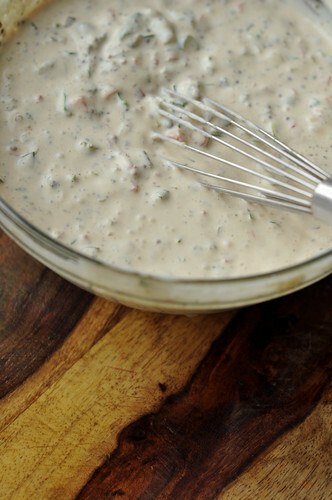 I didn’t have the ingredients for homemade remoulade sauce, but your recipe sounds wonderful. 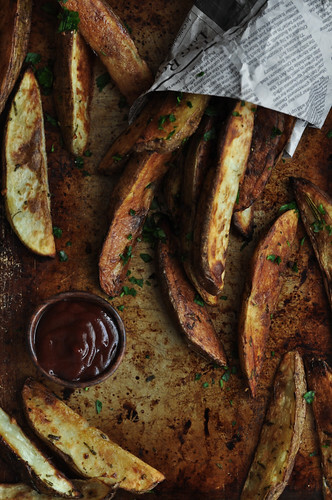 Lastly, we made your potato recipe with sweet potatoes and, again, used coconut oil. Wow…everyone love it! Thanks for the awesome recipes!!! In the oil after the fish was done, (I know, we were bad, but they were so good and crispy!) BTW, this is the second recipe of yours that we have tried. Two days ago we made your Spicy Sausage, Potato, and Kale Soup. That was also delish! I’m so glad I found The Candid Appetite!! yummy my mouth is watering now i wanna just eat this and no one else. Loving these images here! makes me hungry just looking at them. I made all three of these recipes tonight and I think it may be the best thing I’ve ever made. The only thing I changed was using gluten free flour instead of all purpose flour, but otherwide I followed it to a “T.” As others have said, it was so easy! And sooooo delicious. Thank you so much for sharing it. First of all I have to say this batter and the remoulade are amazing!! Best batter for fish I have ever had! However, we found the cooking times to be way too long! The first time we tried it, it was mush on the inside (we were using cod). But we didn’t want to give up and tried it again this past weekend. We found just 2 1/2 minutes on the first side and one minute on the second was perfect! Just wanted to share that infor with you. We had good size pieces too. 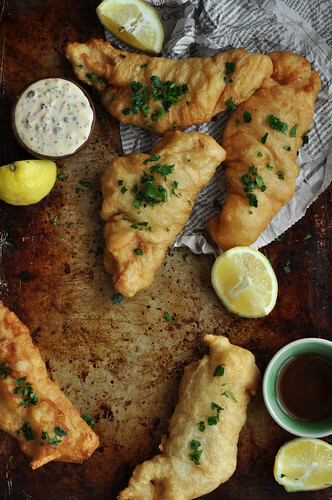 Definitely this will be our go-to recipe for fish fry! !